Not often, but sometimes, just sometimes the best ideas are the ones you arrive at almost instantly. That was the case with this campaign for Diabetes UK. Diabetes UK is the UK’s leading diabetes charity. They help people manage diabetes and fund pioneering research into care, cure and prevention. To mark World Diabetes Day 2012, they wanted a public facing campaign to raise awareness of the signs and symptoms of Type 1 diabetes among parents and healthcare professionals. Early diagnosis of Type 1 is crucial. It means the condition can be managed before it gets deadly – undetected, Type 1 can rapidly case diabetic ketoacidosis (DKA), a serious and potentially fatal complication of diabetes. Type 1 is a complex condition but complexity doesn’t make for a great campaign. 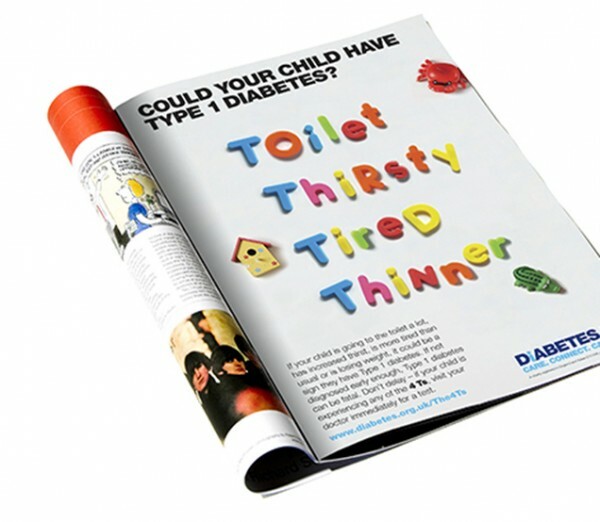 The campaign needed to quickly and memorably communicate the key signs of Type 1 diabetes in children, namely feeling more tired and thirsty than usual, losing weight and, the most telling one, needing to wee a lot. “It’s all the Ts then? Thirsty, tired, thinner….toilet?” said Emma, one of our junior creatives at the time. And that was how the 4Ts campaign was born. As is often the way, you feel you should come up with more ideas. Something smarter, harder. Something that just wasn’t quite so easy. And we did. Yet nothing came close to the 4Ts – it just worked. Diabetes UK agreed and we took the 4Ts forward into national press and TV ads. The words ‘tired, thirsty, thinner and toilet’ written in fridge magnets could be found in doctors surgeries and Parent & Child magazines across the UK. We found it almost bemusing that something so simple could work so well. Yet it did. Within the first few days of the campaign’s launch, the Diabetes UK website received a total of 158,617 unique visitors on the day of launch, there were 3,940 Facebook likes for the campaign and 924 retweets on launch day alone (including one from @Gov). 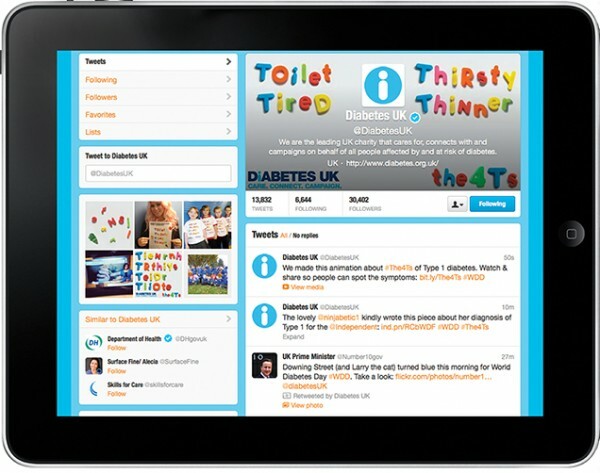 Diabetes UK received an extra 500 followers on Twitter. More importantly, the campaign actually changed the way GPs assess and diagnose Type 1 – they now include DKA at diagnosis for the first time, meaning they can diagnose Type 1 more efficiently and children can start receiving treatment sooner. The campaign went on to become Diabetes UK’s (and our) most successful campaign to date. We’re proud of that. Toilet and all.